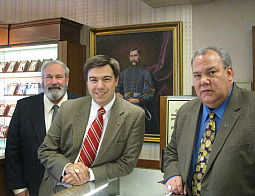 Since 1865, five generations of the Cowardin family have provided the Richmond area with fine jewelry and timepieces. A full service jeweler, Cowardin’s offers on-site jewelry and watch repair, restoration, custom design work, and appraisals. Cowardin’s has a large inventory of loose and mounted diamonds, estate jewelry, watches, pearl jewelry and gemstone jewelry. We carry many designer lines including Gabriel & Co, Amavida by Gabriel, Whitehouse Brothers, William Henry, Cordova by Ron Rosen, Imperial Pearl, Ziva Jewels, Benchmark, Novell, Color Story, and Christophe Danhier. We also have a large selection of sterling silver and gold Rembrandt Charms, including some that depict Richmond landmarks. We also have a large selection of fine Swiss timepieces including Frederique Constant, Victorinox Swiss Army along with pre-owned Rolex, Cartier, Breitling, Omega and many other vintage watches. Return Policy: Returns for items purchased through the website are accepted within 10 days after purchase. Items must be in original packaging in unused condition. Buyer is responsible for return shipping.